A digitized version of Go Review, one of the very first English go publications, is now available. Go Review was published monthly by the Nihon Ki-in from January 1961 to March 1973, then quarterly through Spring 1977. 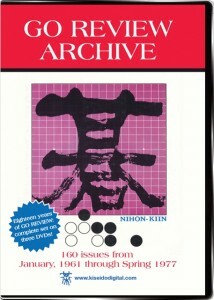 The 160 issues — comprising some 15,000 pages – are available on three DVDs ($75 each) from Kunaki. The early issues on disks 1 and 2 — 60 issues each, from January 1961 through December 1965 and January 1966 through December 1970 — “represent the halting attempts of the Japanese go world in the early 60s to start spreading the game internationally,” reports Bob Myers of Kiseido Digital on GoDiscussions. “The content is basic and written in poor English. However, it’s still very interesting. There are more handicap games (often with famous Japanese pros) than tournament games, apparently in the belief that pro-pro games might be too hard for foreigners to understand. There’s lots of go news, including about foreigners we all know well now. There are great teaching series by big names. Even the ads from big Japanese companies (which are included in the PDFs) are interesting.” Disk 3, — 40 issues from January 1971 through Spring 1977 — contains the last few years of monthlies and then the “meatier quarterly issues,” which are roughly equivalent to Go World (which succeeded Go Review) in terms of quality and content. A sample of the June 1963 issue of Go Review is available for download at Kiseido Digital. NOTE: Disc 1 is shown as “Go Review Archive”, and the DVD cover art could mistakenly imply that this item contains all three discs. It does not. This item is Disc 1, and contains only the first 60 issues.